Age 13: when amazing truly happens. There are few life milestones as mentally bananas for a human male as being a seventh-grader. This is true for a number of physiological reasons, but also because it’s often the true beginning of the #SQUAD. Sure, preteens have friends before this age, but at 13, you begin the ever-important process of being seen — and, with that, deciding with whom you want to be seen. The reality of rolling deep to events. Instead of getting dropped off solo by mom, you meet up early at a #SQUAD member’s house, with your outfit for that night — perhaps even a few options — and then you get dropped off as a #SQUAD, most likely in a minivan caravan. Thirteen is around the time personal style begins, but also a personal style that exists within the accepted style boundaries dictated by the #SQUAD. No two people in the #SQUAD wear the same thing, but there is a general #SQUAD look. These middle school memories aren’t completely out of the blue. They’re rearing their heads now because a joyous event happened over the weekend, one that few people would know of had Nicki Minaj not taken to Instagram on Sunday to alert the world of the glory of early-teen boys. This is the picture. Don’t come at me with other pictures, thinking they’re better. Because they’re not. This is it. Matt is tite. Matt is also tall. Much taller than the crew in the other picture with Nicki, which might be why Matt wasn’t in that picture. Matt definitely has a #SQUAD, but I’m fairly confident all those boys aren’t in Matt’s #SQUAD. Some might be, however. There’s a lot of info in this picture. Let’s refer back. If I had to guess, I’d say this was a #SQUAD unto itself. Before getting into the meat of this pubescence, our two lads on the far left. EIGHTH-GRADERS. I HAVE NO PROOF OF THIS (OR ANYTHING), BUT I’M SURE OF IT. There are so many giveaways. Their personal style is post-#SQUAD. It’s what happens as you’re finishing eighth grade, preparing for high school. You’re trying out new things. You’ve been to 400 bar/bat mitzvahs by now, so you know what you’re doing. Do you wear the standard safe attire? Of course not. You confidently wear your bright pants, your blue penny loafers, your T-SHIRT, because as your hero French Montana said, ain’t worried about nothin’. And above all: You stunt on seventh-graders. You’ve had 18 months to prepare for the moment when it’s NBD to hold Nicki’s hand. In a matter of months, you will be at the bottom of the food chain, as a ninth-grade boy, so these are your glory days. And you know every action you take, the younger boys will watch, will be amazed by, will talk about, indefinitely. When you’re this age, and a boy, you have no idea what to do. In any situation. At any given moment, you could curse or cry. It’s a wild time to be alive. Your body is constantly betraying you, causing your mind to do backflips — typically as a failed attempt in calming yourself down — further causing your body to betray you. This picture is all about dreams coming true, excitement, and then panic. It’s a moment that was never supposed to happen, a moment you’ve long been waiting to have happen, a moment in which you have no idea what to do. This picture should not confuse you. Because every single thing happening makes perfect sense. First off, Nicki. Look at Nicki. There are three 13-year-old boy #SQUAD hands on her body, while she holds one #SQUAD boy’s face and daintily holds the hand of a cool eighth-grader. Just hands everywhere. And interestingly enough, it’s extremely confusing to determine whose hand belongs to which member of the #SQUAD. You think you know at first, but you quickly realize you have no idea. There are three hands on Nicki, coming from these four boys. In order to minimize confusion, it’s time to give these four boys names. The easiest hand to figure out is the hand on Nicki’s waist, between her and Evan. That’s definitely Nate’s hand. 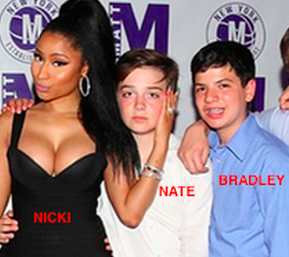 More on Nate’s overall demeanor in a bit, but from Nate’s face, you know he has no issue putting his 13-year-old hand on Nicki’s waist. He’s here for it, as they say. The hand on Nicki’s shoulder is a bit more complicated. Just in terms of arm length, it can’t be Bradley. It could be Nate (and at first truly looks like it’s Nate), but his hand is already — confidently — on Nicki’s waist. Or you thought it was, until you really begin to focus on Evan. In terms of where hands could go, any of these three could be Evan’s. Each permutation of Evan’s hands on Nicki are amazingly awkward, but never doubt what a 13-year-old boy can do when placed next to a woman. 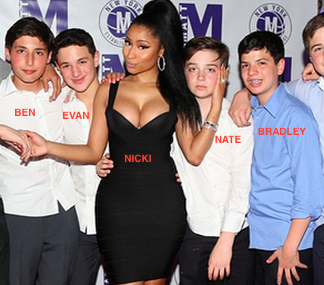 Casing the scene, it truly seems like the hand on Nicki’s shoulder is the work of Evan. But then it’s like, what about Ben? IS THAT HAND THE WORK OF BEN? I thought it was, but there are two giveaways that it’s not. One, Evan is smiling. He’s smiling because his hand is touching Nicki Minaj’s shoulder. The other reason is more technical. If that were Ben’s hand, draped over Evan’s shoulder and onto Nicki, we’d see more of Ben’s arm behind Evan’s neck. It seems as if these fingers are coming from a vertical arm, not a horizontal arm — Evan’s vertical arm. But that’s just two hands. This third hand is completely out of control. Before getting into this mystery, a note about the #SQUAD. Three members of the #SQUAD, wearing the same shoes. Even if they’re not the exact same brand shoes (which they are), they look exactly the same (which is all that matters). I had this moment with my #SQUAD back in the day, but the agreed-upon #SQUAD shoe was all-white Air Force Ones. But I digress. There’s a third hand we need to discuss. In the beginning, before breaking down the other hands, it was damn near impossible to decide where this third hand came from. I was so confused, I convinced myself that it wasn’t even a hand, but a cutout in her dress — until I saw the side of her dress. There’s no cutout. So, yes, that must be a third hand. 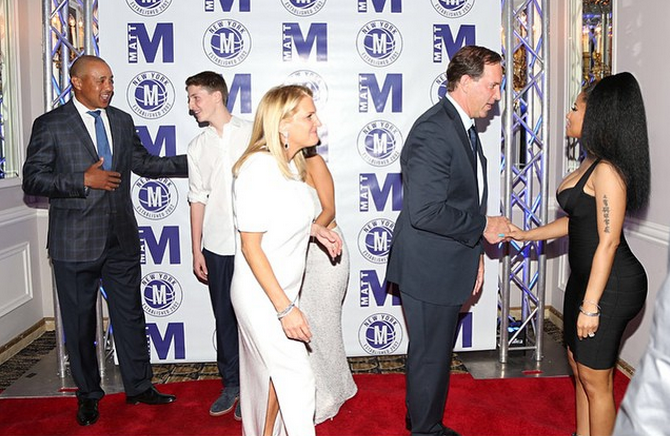 And further: Yes, that is John Starks talking to Matt — a Matt who I now realize is WEARING THE SAME SHOES AS THREE MEMBERS OF THE #SQUAD. Actually, let’s be real. Three members of the #SQUAD are wearing the same shoes as Matt. That’s definitely the way it went down. We’ve all been there. Who doesn’t remember the first time they saw someone at school wearing Girbaud jeans, begging mom to take you to the mall the following weekend, and then the next Monday showing up in jeans that were also covered in French velcro. It’s Bradley’s hand. I promise. I know, right now, you don’t think it is, but let me assure you: That hand is the work of Bradley. You didn’t even consider Bradley’s right hand, because you were so focused on the artistry that is his left hand. It can’t be Ben, because he’s too far away. 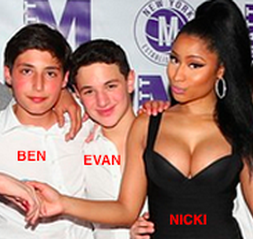 It can’t be Evan, because his left hand is already on Nicki’s shoulder. It can’t be Nate, because one hand is on Nicki’s hip and the other is hanging in that super chill way that sums up Nate’s entire existence. It can’t be the guy on the other side of Bradley (Jimmy), because no one has ever put their arm around two people in human history. So, purely by process of elimination, it’s Bradley. Which is great, because Bradley is a legend. Bradley did something I’ve never seen anyone else pull off. The wildest part of the third hand is that we’re seeing the inside of Bradley’s hand, not the typical outside of the hand. The backside of his 13-year-old hand is on Nicki’s waist, as he essentially holds it. Bradley’s just trying to hang out with his #SQUAD mate Nate — with Nicki’s body accidentally in the way — but Nate’s trying to hang out with Nicki. The next few years will be a trying time for the #SQUAD. Internal and external forces will constantly threaten the strength of the #SQUAD. The #SQUAD will grow, the #SQUAD will shrink, the #SQUAD will fight, and, for a moment, the #SQUAD may even disband. It’s what happens when you have six wonderful boys headed in six different directions at six wildly different speeds. Who knows how it will all play out, but what’s certain is that this is where it all begins.